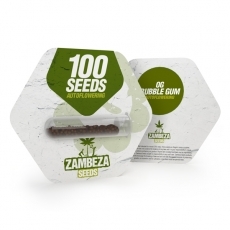 Zambeza took one of their best-performing OG Bubble Gum, who herself is a phenomenal cross between the legendary OG Kush and the tasty Bubble Gum and added Ruderalis to give the strain autoflowering qualities. Out comes one of the fastest autoflowers that you can grow which shines with an outright spectacular taste and some serious potency while keeping things super-easy. 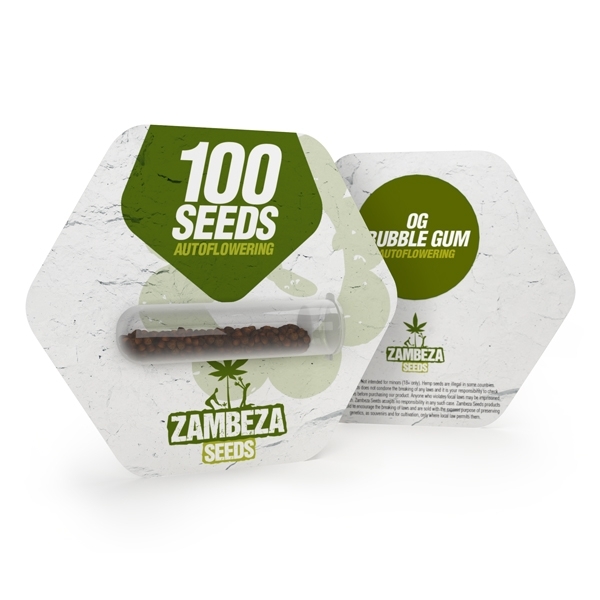 In her amazingly short life of only 50-60 days from seed to harvest, OG Bubble Gum Autoflowering can produce a good 350-400g/m² if you grow her indoors. The plant will normally stay between heights of 60-90cm, which makes her ideal for smaller tents and other limited spaces. Outdoors, OG Bubble Gum Autoflowering won’t get much taller; she’ll normally reach 110cm at most where she can yield up to 175g per plant in optimal conditions. It’s because of her compact size that she can be a good choice to grow on balconies and terraces. The small size along with her good genetics make her very manageable adding to the fact that she's very easy to grow. One outstanding quality about OG Bubble Gum Autoflowering is that Zambeza managed to keep her potency very high for an autoflower. With 16% of THC, she makes for a powerful smoke that will deliver a strong indica effect for the deepest relaxation that will make you incredibly stoned in no time. With her relaxing power comes also a pleasant happy feeling that makes smoking her great and joyful experience! With her flavourful parents, it’s no wonder that OG Bubble Gum Autoflowering goes all out when it comes to her taste as well. If you smoke her you will no doubt note the unique OG Kush flavour that is slightly acidic and refreshing like lemon paired with the sweet and fruity berry flavours of the Bubble Gum. On top of it all, you can also taste some subtle notes of oriental spices which compliment her flavours amazingly well. OG Bubble Gum Autoflowering is a spectacular autoflower that won’t disappoint no matter how you look at her. Amazingly, she delivers all her goodies like her great taste and the potent high in record time with basically no compromises. If you’re looking for a truly worthy autoflowering indica to grow you probably don’t need to look any further. You can easily stock up on larger quantities of this fabulous autoflower because OG Bubble Gum Autoflowering bulk seeds are available in packs of 100 seeds.